Magick, the non-identifiable and illusive, ‘something,’ that holds everything together; the cosmic glue of the universe. 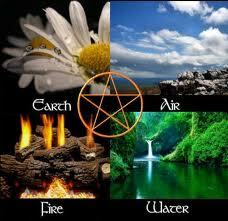 Elemental Earth…the direction South, our physical body and our world as we know it. In magickal theory it is the power to, ‘keep silence,’ the amazing ability that our bodies have to breath without conscious thought. For our heart to beat and our pulses to race: for our glands to respond to fear, pleasure and pain and for all our senses that respond to both internal and external stimuli. When we are out of balance in elemental earth we are unable to manifest our goals and dreams into reality: our fundamental, natural self becomes unable to live in the moment and can fall into ennui and even depression, then Water swamps us and our internal Fire can be on slow burn, whilst too much Air can make everything into an intellectual treatise. Elemental Air…the direction East, our higher intellect and in magickal theory, the power, “to know.” Air stimulates the pineal and pituitary glands, in the brain, to aid with higher learning and concepts. Too much Air makes us flighty and leaves us with business unfinished. Water and Air, unbalanced can make us over emotional and our Fire is blown out by Air’s draft or fanned to raging flames, by its gale force winds. Elemental Fire…the direction North, our fire in the belly and our electrical circuitry, coordination and get up and go ideas. Too much Fire will burn us out. Our thyroid and adrenal glands become hyperactive, leaving us exhausted and spent. We become weakened and fuzzy headed and our body temperature drops. Too little and we have no energy to act for ourselves. To much Air and the flames again are raging out of control but too much Water will drown the flame again whilst more Earth will keep it steady, that we may manifest our desires. Elemental Water…the direction West and in magickal theory, the power “to dare.” All our emotions are governed by the power of Water: our blood and lymphatic fluids, saliva and the fluid around our brain. Too much Water and we are over emotional, weepy and weak: too much Air will cause a Tsunami or, fan the flames of Fire and the Waters will boil over. hey gorgeous, love your blog ,blessings my broom sister..lol!!!! Thanks for sharing this – it is always a pleasure to read your blog, I learn so much and always wait for the next installment.